These two peaks could be climbed on the same day, but I did them as separate helf-day trips. I spent the night in Mojave, drove to and climbed Pinto, and I was still back to the car by mid-afternoon. After Eagle, I drove to Rabbit and packed part of the way in to make the summit day easier. The Pinto trailhead (waypoint PINTOT) is at the Turkey Flats informative exhibit sign. It's not all that informative, but at least you can be sure you're at the right place! There is a wilderness registration board here, but it's only for overnight travel. I left my car just before 9am, walking a straight line on a bearing of 34 degrees. About a mile from the car I popped over a low ridge (waypoint PINTO1), which the DPS Guide calls a sand dune but which has rocky outcroppings, and dropped about 100' into Pinto Wash (waypoint PINTOW). 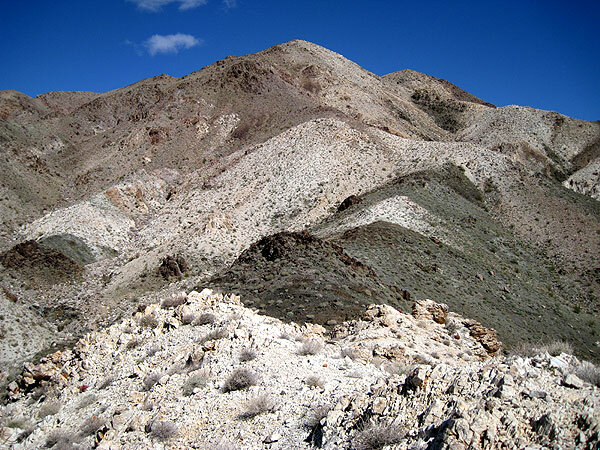 I headed for the narrow ridge in the center of a large alluvial fan. The base of the ridge (waypoint PINTO2) is 2.4 miles from the trailhead. I followed this ridge north until it bent northeast (waypoint PINTO3) and joined the larger ridge on the right (waypoint PT2820). 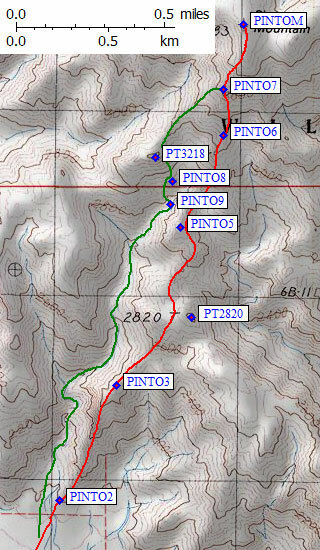 There was a significant cairn between PINTO3 and PT2820, perhaps where the two DPS Guide routes join, but my descent route did not come back on any part of this ridge. There is a chunk of use trail here, but it's not continuous. I bypassed Point 2820 on the left (west) but mostly just stayed on the ridge. Above 3.2k (waypoint PINTO6) this ridge merges into a ridge from the left. 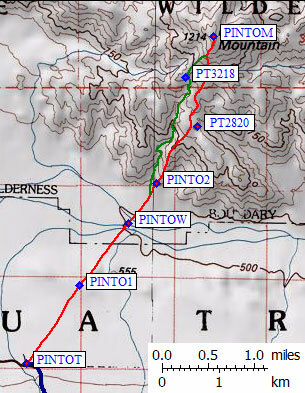 Pinto has two summits, and the higher one (waypoint PINTOM) is on the left (west). It took under 3 hours to reach the the 3983' summit of Pinto Mtn, even with several long breaks, and less than 2 hours to return via a longer route. Heading down, I dropped off the ridge to the right (west) at waypoint PINTO7, to follow the southwest ridge leading to Point 3218. I turned south, still on the ridge, just before reaching Point 3218. The bowl between this ridge and the one I climbed looked pretty ugly, which must be why the DPS Guide has you climbing onto a ridge when ascending this drainage. To avoid cliffs, I bypassed the bump at PINTO8 on the west, reaching the main drainage at PINTO9, just below a white blocky chalky section that would serve as a landmark on the way up. This drainage (the green line on the map above) is NOT better footing than the ridge, but it does offer variety. The winding canyon makes the mileage higher and the brush and boulders make the walking harder. The DPS calls this Eagle "Eagle Mtn #1", but I'll call it Eagle Mtn South because it's south of "Eagle Mtn #2". Preferring NOT to start from a campground, I used a trailhead (waypoint EAGLET) that must have been a road to the Borrow Pit (waypoint EAGLEB) marked on the map, which is now a seasonal pond. I walked an almost perfectly straight line at a bearing of 131 degrees, detouring around sparse brush, until I reached some rolling granite hills. Here the washes can slow you down, and there is no obvious best way through. The ups and downs aren't very big so mostly I stayed out of the wash to avoid meandering and sand. At waypoint EAGLE1, 2.5 miles from the car, I started intentionally staying right (south) of a larger wash. On the way out, I instead followed this wash almost to the road (see the purple track log line), but it is much longer and not better walking than the direct line I came in on. 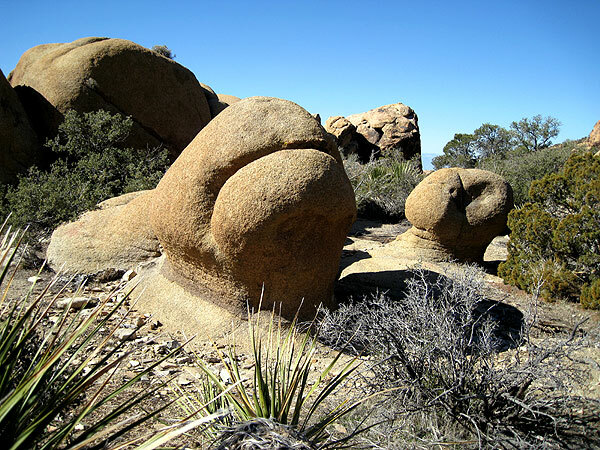 Take the wash if you want scenery and interesting rock formations, but good luck picking the right branch on the way up! The wash enters a canyon mouth, the canyon narrows, and at waypoint EAGLE3 (4.2k) there is a branch where you stay right in the narrowest branch. This branch doesn't really show on the USGS map, but it's visually distinct from the broader canyon to the left. Almost immediately after taking right branch, begin climbing up the right side of the narrow branch. Do not follow the narrow branch at all, because after it turns left you'll be on wrong side of a gully. Climb up the right side of a gully that comes into the narrow branch at the corner, topping out at EAGLE4, then bear left and traverse into the gully floor without descending. Follow the gully east, as it gets wider and gentler, to the obvious notch (waypoint EAGLE6) at just over 5k. There's no reason to climb or descend, just pick your way through the rocks for an almost level traverse southeast out onto the ridge, then down toward a saddle (waypoint EAGLE7) at just under 5k. I think it's best to go around the LEFT (north) side of the bumps along the ridge because getting around the cliffs on the ridgeline requires going down one side or the other - you might as well just head for the bowl (EAGLE8) on easy footing. This bowl has really cool rounded granite protrusions which might become balanced rocks in a few million years. There's a nice ramp from EAGLE8 to EAGLE9, and it's Class 1 to the summit from there. I reached the 5350' summit of Eagle Mtn before 9am, about 3 hours from the car. There was a good cell phone signal here, the only one I got anywhere in Joshua Tree. 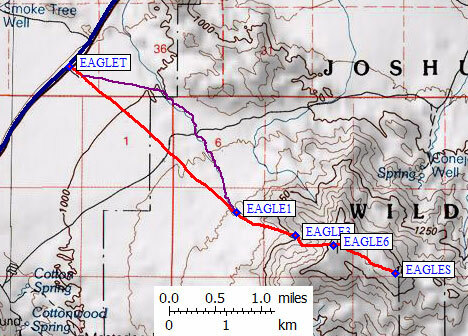 As mentioned above, I followed the wash (see the purple line on the map above) down from waypoint EAGLE1 on the way out. Where the wash crosses elevation 3480 there was a completely unique (for this area) red and white rock outcropping with interesting crystals. Other than that it was decomposing granite and sand. As the washes merged the sides got higher and steeper, so I climbed out the west side of the wash around 3.3k and headed back to the Borrow Pit. If you followed the wash all the way to the pavement, you would end up about 1.3 miles north of the trailhead. I ended this day with a drive over to Rabbit, where I packed part of the way in to make summit day easier.